Recognition has become a central thematic in contemporary political, social, and international relations theory. Its fundamentality to social life is apparent in that how we recognise others and are recognized by them is essential to both the identity of individual subjects and the relations between self and other in ethical community. As such, recognition is properly basic to all social interactions; between individuals, groups, local communities and sovereign states. Without the foundational act of recognition, relations can become unequal and antagonistic, leading to social pathologies, denigration and even open conflict. 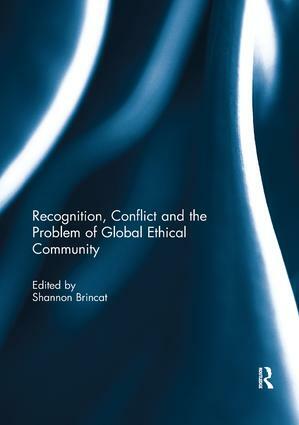 This volume brings together leading scholars of recognition theory in international relations, sociology and politics, to discuss the potential for recognition to understand the problem of conflict and the possibilities in developing global ethical community. Shannon Brincat is a Griffith University Research Fellow based in the School of Government and International Relations. He has been the editor of a number of collections, most recently the Special Issue of Globalizations ‘Dialectics and World Politics’ and the three volume series Communism in the 21st Century (Praeger, 2014). He is also to co-founder and co-editor of the journal Global Discourse. His current research focuses on recognition theory and cosmopolitanism; dialectics; tyrannicide; climate change justice; and Critical Theory. He has articles published in the European Journal of International Relations, Review of International Studies and Constellations, amongst others.